I’ve met a lot of cool people over the past decade of whisky geekery, and amongst those is a gentleman by the name of Darren Rook. I’ve known him since his days managing the Scotch Malt Whisky Society rooms in London and being the original whisky guy for Whisky Squad, and he’s always talked about opening a distillery. That and orgies in hot tubs, but mainly distillery plans. So, he opened a distillery – The London Distillery Company. They’re mainly known for their gin – Dodd’s – but they’ve got some spirit maturing that will one day become whisky. I popped down to the distillery yesterday to pick up a bottle of a new gin – Kew Organic Gin – and came away with a sample of something that Darren had been pouring at the Whisky Picnic: my 13th advent calendar spirit and yet another ‘not a whisky for legal reasons, but sort of’: London Distillery Company Aged British Rye Spirit. I’ve been fortunate to see many of the milestones of the distillery’s development since its founding in 2011. I’ve seen the building go from a foam-lined, falling-down Victorian dairy to a hipster-friendly, exposed-brickwork and reclaimed-wood distillery, and was present for the first gin and ‘whisky’ distillation runs. However, the next chapter in the company’s life is about to begin, as they’re moving. The dairy is being knocked down, to be redeveloped by the current owners, and TLDC have found a new home – Bermondsey, one of the hubs for drinks development in London. They’re in the process of packing up and moving, but in the new year, you’ll be be able to find them near Maltby Street Market, on Druid Street. With a stack of breweries, distillers and foodie people within a stone’s throw, it’s an excellent location and I look forward to popping down to visit once they’re plumbed in. Anyway, Darren’s obsession when it comes to making whisky is heritage. He’s dug around in the National Collection of Yeast Cultures (for such a thing does exist) and worked with Warminster Maltings to source traditional distiller’s yeast and old-fashioned malt to try and recreate the whisky of the past. However, for the rye spirit I’m tasting today, he instead went for something entirely new. 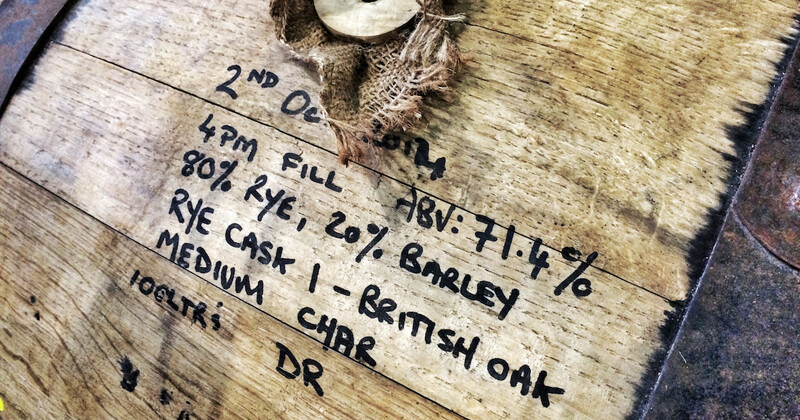 The spirit was made using a mash of 80% British rye, grown in Cornwall, and 20% malted Quench barley – all organic. They then used what Darren describes as an ‘old-school London brewer’s yeast’ in a five-day fermentation, and double distilled the resulting wash in Matilda, the distillery’s pot-still. 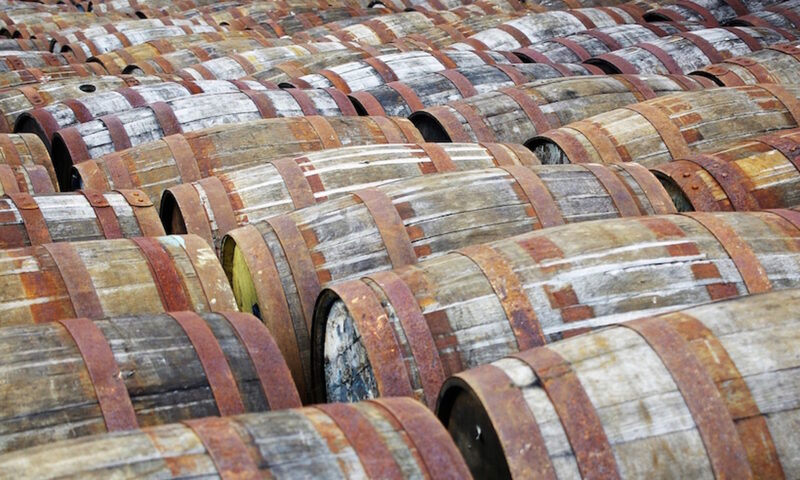 The spirit was filled into a new English oak hogshead, made by Alastair Simms of the White Rose Cooperage using wood from Herefordshire – the cask was built in 2010 and then left to season for three years before TLDC got hold of it. The spirit has now been in the cask for 14 months (14 months and 10 days, to be exact) and Darren has drawn off some liquid from time to time for various projects, including a cocktail for the Whisky Picnic: TLDC cocktail guru Terri made an Old Fashioned with the spirit, using a home-made syrup that included some rotovapped bits and pieces. It was a bit sweet for me, but I begged a sample of the neat spirit from Darren when I visited yesterday. Nose: Layers of toffee and caramel – Crunchie bars and bittersweet cinder toffee, butterscotch, brittle caramel, treacle toffee and toffee apples. It’s thick and sweet, but there are some sharper and obviously younger spirity notes poking through, as well as some apple skin sourness and very soft rye notes – menthol, aniseed and sourdough. Water brings out the cinnamon notes – Fireball gobstoppers and Cinnamon Grahams. Palate: Sharper than the nose suggests, with unripe apples quickly smothered with butter and vanilla sweetness. Then comes rye spice – cinnamon sticks, cloves and cardamom – and lots of oak – sweet vanilla and sour sap. Behind the wood there are some softer notes of spiced fruit loaf and cinnamon buns. Water amplifies the rye notes, bringing out more menthol and spice, but also softens things, making it much more approachable. Finish: Spiced apple cake with thin custard, fading to apple peelings and hint of aniseed and cinnamon sugar. Vanilla makes a late appearance, especially after adding water. This is obviously not whisky yet by UK standards, but it reminds me of youthful American whiskey. I’m not generally a fan of those, but this blows any of the ones I’ve tried out of the water. It has a lot of sweetness, but with a drop of water to temper that, it’s excellent. Ben Cops liked this on Facebook. Hannah Kelly liked this on Facebook. Darren Rook liked this on Facebook. Chris Matchett liked this on Facebook.